My friend Dana doing a promo for our gym. We really have the best people. Makes it so much easier to get your *** in and work out. Been running and doing push ups this week, my lower back was a bit sore so I'm staying active but nothing that bothers it. I just went outside and did 18 consecutive double unders with the jump rope. Single double single double etc for 18 DU's without stopping! That's a pretty big deal for me, I dont have double unders yet. Mainly because I never practice them. Sup with the funky food pyramid? So basically you'd want to eat the stuff on that pyramid and avoid grains, dairy, starches, processed foods and sugars. I havent personally fully committed to it (yet) but I would like to give it a try. At this point I just try to be aware of it and cut down on the bad stuff and increase the good. Raw unpasteurized dairy sounds dangerous and I don't see much fiber up there but the rest seems practical and just, well common-sensical (which isn't too common ). How long have you been at it and have you seen good results? When I eat right everything falls into place. More energy, better mood, able to lift more and run faster, look and feel better all around. Highly recommended! 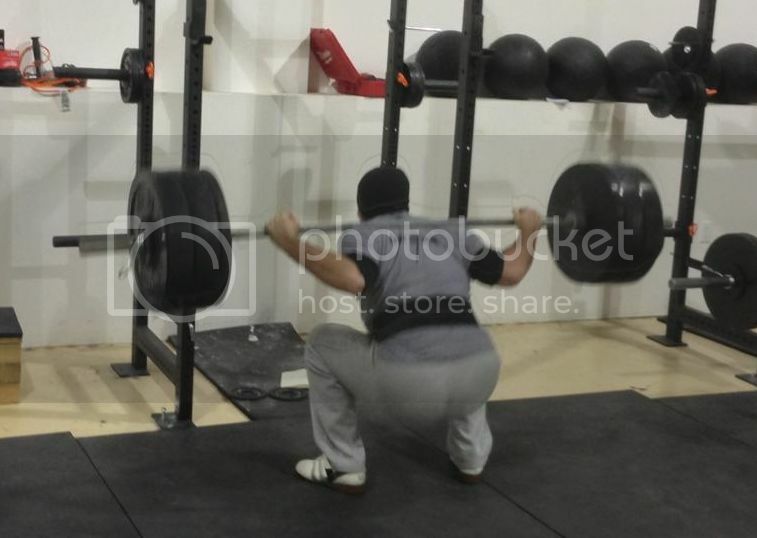 Squat 330 5-5 ... 4. Crap. Fail but I can live with it since my form felt cleaner than it has in weeks. I rushed the last set. I wont do that next time. PS the hot new girl was impressed that I could lift so much weight. Yeah Buddy. Finally feeling more comfortable with the press. By far my weakest lift. Schultz says she is proud to have qualified for the Regional considering all she juggles as a mother, teacher and athlete. "I look at how well I live my life and balance everything and I am pleased by how I did," she says. Oh PS finally did a bench press 1RM attempt and got 245 easily. It's one of my weaker lifts by far and I somehow missed trying a one rep max for the past 3 years. Should have hit 255 but I **** it up and missed it. So next time I'll have a good starting point and hope to improve it a lot. Been doing a mix of heavy lifting, crossfit, running, sprinting and good old dumbell curls. 20:16 RX I was pretty happy with that but room for improvement. Rounds 3 and 4 I didnt do the OHS unbroken. And my runs were meh after the 2nd round. That was rough, forget my time on that. I think like 29:42 or something. Ethan, Eva and Cyn came to watch me though. Ethan had a blast in the gym afterwards. 12:14 My sit ups sucked. Double unders were decent. 320# 8 times last night. No big deal. Happy Birthday.